The stuff I've seen that you haven't consists of 'The Big Bus', 'The Cheap Detective', 'Up Close and Personal' and 'Practical Magic', so... hopefully you'll get better suggestions. Still, Channing + Dianne Wiest + Nicole Kidman + Sandra Bullock in the latter now looks like some kind of Crisis in Infinite Oscars special event, so at least it would tick a few boxes. P. S. - I can't tell you how much I loved the piece on 'Postman', which is the most persuasive take on Lana Turner and her star persona I've ever read, and certainly the first to kind of get me on her side. No less valuable for stumping for Cora too - why do people think she's the definitive black-hearted femme fatale? Seems like a classic case of allowing generic frameworks get in the way of actually seeing what's staring you in the face. One of her Emmy nominated TV film roles would be best, I think, and her winning turn in The Matthew Shepherd Story (falling into the crutches of most TV films, if I recall correctly but a vivid performance from her, for me). Channing is one of those actors who I felt never got the chance to be as good on the big screen, and her onscreen persona is so...big (for want of a better word) I wonder if that's why the stage loved her more. Also, The Baby Dance is another TV one, netting her an Emmy nod, with Laura Dern that is, once again very small-scale canvas (and a bit annoyingly pat_ - looking at adoption - but finely acted by both the leading ladies. You dodged a fat bullet with Three Coins in the Fountain, I just watched it last month and it's pretty awful. I'm not going to pretend that "Practical Magic" is great, but I'd be hard-pressed to resist placing Stockard in some kind of ranked context with the rest of those actresses. Otherwise, I'd echo the recommendations of her Emmy-nominated work, were it Netflixable. I can't even particularly recall Stockard Channing appearing in it, but Bright Young Things is a wonderful film regardless, and I'd just love to read a piece from you on it. I don't know if you'll be able to find this in time, but my mother introduced me to this pre-Grease TV movie called The Girl Most Likely To... that she loved as a kid. In the film, Stockard plays an ugly ducking who becomes beautiful and exacts revenge on all her high school bullies. It's silly and over the top, and I don't know if I'd rank it with Stockard's best work, but I had a fun time watching it. @Laika: Yeah, I think I'm steering clear of most of those post-Oscar "Hey, we finally acknowledge you" parts, though I'm sure I'll see Practical Magic at some point in my life. Meanwhile, I'm so happy you like the Postman piece so much. It's great fun to write about a movie that a lot of people are really invested in, and to do so without having any real idea what the usual critical line is. I'm so happy that fans of the film like the piece; I really loved writing it. @A:EE: I read Le Divorce right before seeing the film and fell so in love with it that I couldn't not be disappointed in the movie, which has a very different tone: as you say, messy and simple, which might be charming on second pass, but I was not a great audience for it. I might try again some time. As for your Lifetime suggestions, one of them is sitting right next to me and is in the final heat to be my Stockard pick. Great minds, etc. @Derek: If only Maggie gave more options. I guess when the time comes I could revert to The Cardinal? @Nathaniel: Your misgivings about Pfeiffer in that movie have struck a chord over the years, and since I thought Sela Ward sort of nailed the same part in a TV movie around the same time, I think Up Close & Personal will go on and on without me. Just like Céline's heart. @Joe: Ranking the actresses of Practical Magic! That could be a perk. Based on the preview, Nicole Kidman's tiny blue sunglasses are starting her ahead with a healthy handicap. @Dave: That's one of those movies I've occasionally heard good things about it but for some reason I just feel magnetically opposed to it. Is it the cast? The title? The trailer? I won't see it this time, but I appreciate having your vote of confidence so I can get to it later. @Dame James: I totally put in a request for this at the library, and if it arrives, it's likely to be my pick. 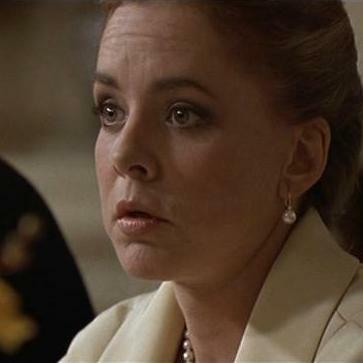 Stockard Channing as a played-light Carrie White, in a script by Joan Rivers?? What? Multiple Sarcasms!!! I wanna know your insights on that little seen picture. Wayne Wang's Smoke!!! She won awards in that little gem. I loved her duet with Laura Dern in "The Baby Dance". She also had incredibly good chemistry with Beau Bridges in "Married to It", playing this sort of a hippie mom. On a different scale, her story in "Three Needles" was incredibly disturbing. Loved her so much in SIX DEGREES that I planned on naming my first child Louisa in homage(assuming that Ouisa was originally a Louisa). Well, I had a boy, and then 2 more boys. Agreed, her character's definitively to the Manhattan born! FYI - just found out about you from a bunch of smart aleck Gallatin kids having lots of fun wasting time on your website.